The sandhill crane is a species of large crane of North America and extreme northeastern Siberia. The common name of this bird refers to habitat like that at the Platte River, on the edge of Nebraska's Sandhills on the American Plains. This is the most important stopover area for the nominotypical subspecies, the lesser sandhill crane (Grus canadensis canadensis), with up to 450,000 of these birds migrating through annually. 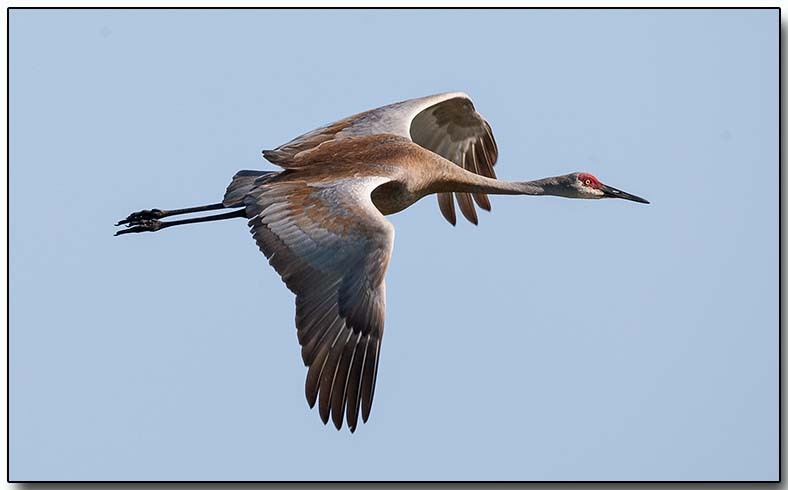 Sandhill cranes' large wingspans, typically 1.65 to 2.30 m (5 ft 5 in to 7 ft 7 in), make them very skilled soaring birds, similar in style to hawks and eagles. Using thermals to obtain lift, they can stay aloft for many hours, requiring only occasional flapping of their wings and consequently expending little energy. Migratory flocks contain hundreds of birds, and can create clear outlines of the normally invisible rising columns of air (thermals) they ride. Sandhill cranes fly south for the winter. In their wintering areas, they form flocks over 10,000. Sandhill cranes are fairly social birds that usually live in pairs or family groups through the year. During migration and winter, unrelated cranes come together to form "survival groups" that forage and roost together. Such groups often congregate at migration and winter sites, sometimes in the thousands.